Today, 28 June 2015, a SpaceX Falcon 9 lifted the cargo-laden Dragon off the pad at Space Launch Complex 40 at Cape Canaveral Air Force Station to begin CRS-7 to the international space station. The SpaceX rocket seems to have broken apart entirely in what looks like a major mission failure. During the video feed, the rocket started smoking and then appeared to come apart altogether about a minute or more into launch. The mission also includes another attempt by SpaceX to recover its Falcon 9 reusable rocket stage, via an ocean-borne automated drone barge that doubles as a landing platform. The first International Docking Adapter headed to the International Space Station was one of the major losses of today’s failure. The adapter, designated IDA-1, was built by Boeing and was loaded into the trunk of the SpaceX Dragon spacecraft that was launched today aboard a Falcon 9 rocket on the company’s seventh commercial resupply mission to the orbiting laboratory. Astronauts would have worked inside and outside the station to install the docking adapter on the pressurized mating adapter at the forward end of the Harmony module. 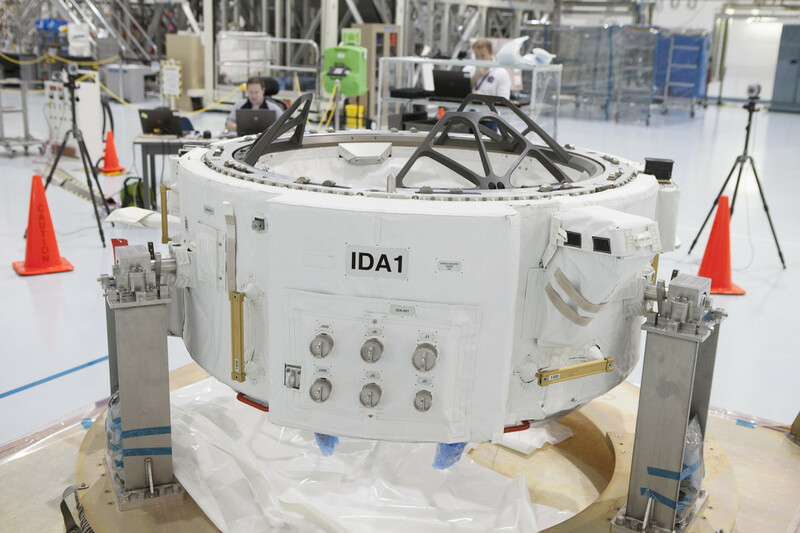 Weighing just over 1,000 pounds, the first IDA was to be moved out of the Dragon using the space station’s robotic arm and temporarily stowed on the external station structure. Spacewalking astronauts and robotics controllers would have later attached IDA-1 to the Pressurized Mating Adapter at the forward end of the Harmony module and connected cables and the other relevant systems to make the adapter a permanent part of the station. The second IDA is scheduled to be delivered to the station on the ninth SpaceX commercial resupply mission and will be installed on another Pressurized Mating Adapter that will be located on the space-facing side of the Harmony module. The adapters were built to the International Docking System Standard, which features built-in systems for automated docking and uniform measurements. That means any destination or any spacecraft can use the adapters in the future – from the new commercial spacecraft to other international spacecraft yet to be designed. The adapters also include fittings so power and data can be transferred from the station to the visiting spacecraft. The work by private companies to take on low-Earth orbit missions is expected to free up NASA’s resources for future missions into deep space with astronauts in the Orion crew capsule launching on the Space Launch System Rocket to prepare for future journeys to Mars. It took international and national teams working together to construct the IDAs. Parts from companies in 25 states were assembled to make the adapters, which measure about 42-inches tall and about 63-inches wide each. The Russian company RSC-Energia made the primary structures of the IDAs. Docking targets, laser retro-reflectors and related systems are arrayed around the outer perimeters to give them an outer diameter of about 94 inches. NASA’s Johnson Space Center also collaborated on the design, Ortiz said. 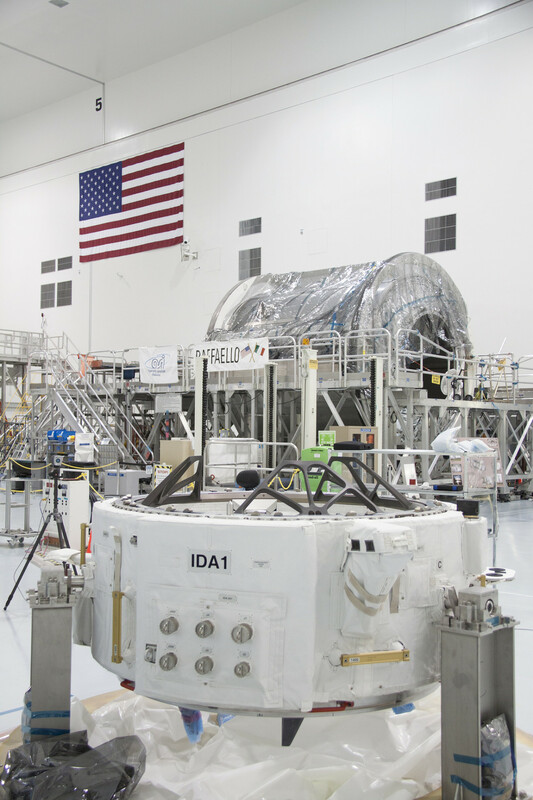 The systems and targets for IDA-1 were put through about a month of tests at Kennedy’s Space Center’s Station Processing Facility before being loaded for launch on SpaceX Dragon. The targets are much more sophisticated than previous docking systems and include lasers and sensors that allow the station and spacecraft to talk to each other digitally to share distance cues and enable automatic alignment and connection.